Anyone following us knows we’re a bit keen on birds. It all starts quite innocently when you live in a place like this. After the chaos of a young family comes an opportunity for quiet reflection, once they grow up and fly the coop (so to speak). Living in the bush means the only sound is that of nature. It’s only then, when you get a chance for a nice quiet afternoon on the verandah with a cold beer or good red that you start noticing the birds. Really noticing them. You’ve always known there were birds and you knew the common ones and the noisy ones and the ones you could feed. You start by wondering what a certain bird is called and where it’s supposed to live and then you want to know its range and if the female and male are the same. 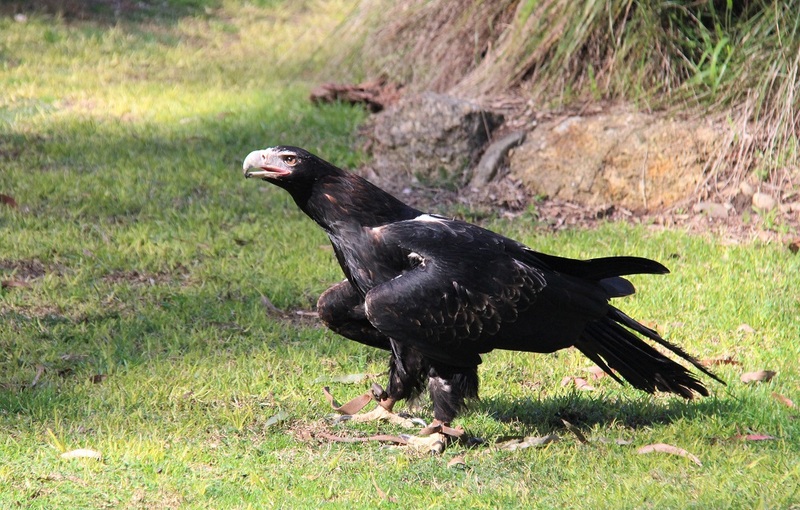 And the biggest of the lot is the Wedge-tailed Eagle. Some birds are very easy to distinguish though – both on the ground and in the sky. And the biggest of the lot is the Wedge-tailed Eagle. What a mighty bird. It’s Australia’s largest raptor with our favourite – the White-bellied Sea Eagle – a close second. Wedgies are so named because their tail looks like a wedge when in flight. They are dark-brown black and have chunky legs when standing. They are formidable in size, standing almost a metre tall as they feed on prey such as rabbits, rodents and (sadly) roadkill. We recently had a tour of Healesville Sanctuary near Melbourne with our two little grandsons. What a great zoo! The bird show was highly recommended so we managed to grab a seat. But for us – the highlight was seeing a beautiful female wedgie up close as she starred in the show. It’s rare to see these big birds so close. Check out her beak! You have a good chance of seeing an Eagle on our tours. Never a guarantee, but we do see plenty of White-bellied Sea Eagles and the occasional battle between them and a Wedgie. Take a tour – you never know what you’ll see but it might be life-changing.